Our HEAVY DUTY Long Rustic painted metal barn stars come in 3 sizes and multiple colors. We prime our metal stars with an industrial strength primer, paint a black base coat, then use a "severe exterior weather 25 year plus paint". This combination of primer and paint allows you to use the stars indoors to decorate your home decor and outdoors to accent your home and garden with your own unique choice. All longs stars are measured left to right (tip to tip) and top to bottom (tip to tip) and handmade therefore approximate. 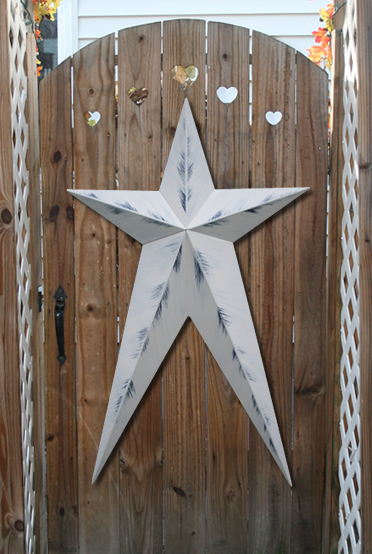 Hang on your inside walls for metal wall star art, outside, or whatever you decide these metal stars are sure to be an accessory that you will love. Rustic colors have a black underlay with your choice of color feathered on top.